Today’s readings invite us to respond to the wonder and mystery of God with a clear and joyful “yes.” In 2 Samuel, God surprises David with the promise of an eternal kingdom to David’s heir. In his letter to the Romans, Paul proclaims that in Jesus Christ the mystery of the ages is revealed. In today’s gospel, Mary opens her spirit, soul and body to the mystery and word of God. Some commentators point to a pattern in Mary’s encounter with Gabriel that parallels the process many people have when God enters their lives. The first response is fear or awe. Mary “was much perplexed by his words” (Luke 1:29), just as any of us would be, finding it incomprehensible that we have found favor with God. Surely the all-powerful God doesn’t need one who’s as scatter-brained, selfish, disorganized or downright shifty as we think ourselves? The next stage is puzzlement. 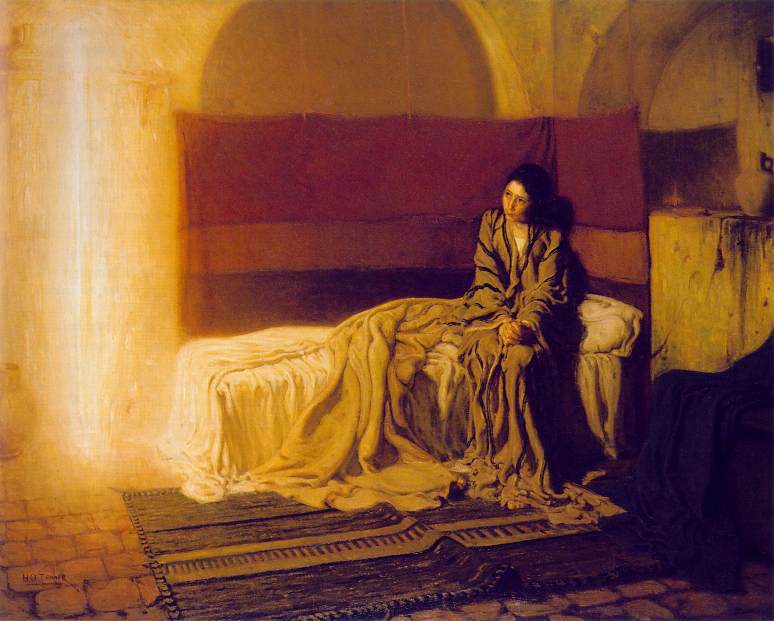 Mary asks, “How can this be?” (v. 34). The angel, used to human limitations, doesn’t strike her down for honest wonder. We mustn’t be afraid to voice our questions and doubts to God; God can handle them. The angel’s words open a third stage: “Nothing will be impossible with God” (v. 37). That hinge makes what seems preposterous doable. Such assurance of a larger plan enables Mary to respond generously and confidently. The only door through which we pass into the future is trust. Mary models total acceptance of whatever God wants: “Let it be with me according to your word” (v. 38). Next time we encounter a project or relationship which first makes us fearful, we should remember Mary’s process. It doesn’t happen instantly, but it ends perfectly. In our baptism, and as Mary did, we are called to an open response to God’s word and presence. hail, thou, the redemption of the tears of Eve. hail, bridge leading from earth to heaven . . .
hail, thou from who flows forth milk and honey. hail, door of solemn mystery. “Selected Praises of Mary from the Agathestos Hymn,” Greek, sixth century. What do you think Mary’s thoughts and feelings might have been as Gabriel appeared and spoke to her? Why do you think she accepted the angel’s charge? Why did Gabriel need to tell Mary not to be afraid? When have you felt the presence of the Divine in your own life, and what was your response? What qualities of discipleship does Mary present for us in this passage? What is the example that Mary sets for us today? Read Mary’s song of praise and thanksgiving (The Magnificat) in Luke 1:46-55. What added dimension do these words give to the profile of Mary? How are we challenged by these words as we read them today? As you look at the other lessons appointed for today, what do you learn about the fulfillment of God’s promises? Andrew Carter’s “Mary’s Magnificat” sung by The Choir of King’s College, Cambridge, 1995. This entry was posted in Advent, Christmas and tagged Advent, Annunciation, Gabriel, Gospel of Luke, Mary. Bookmark the permalink.